workflow runs on item created and item changed events. Here, approved date and complete date are changing to item modified date whenever I modify item. I don't want to update approved date and complete date once they are set. According to your description, my understanding is that you want to add approved date to a tasks list via SharePoint Designer. Create a column named “Date” in the tasks list. In SharePoint Designer, create workflow in tasks list, add condition “if any value equals value”, the former value choose Outcome field, the latter value type “Approved”. 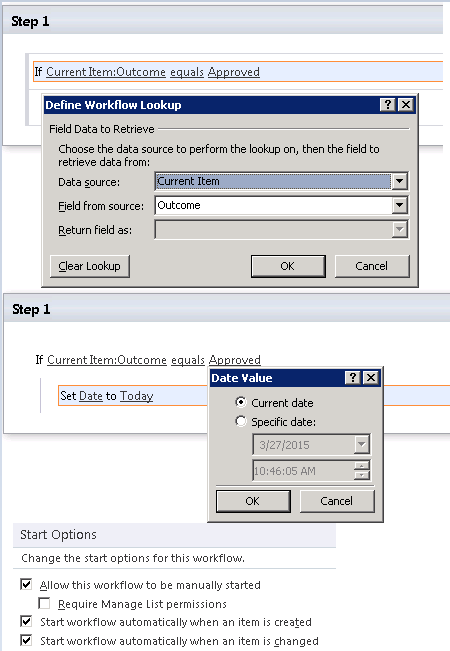 Then add action “set field in current item”, field choose the “Date” column, value choose current date, in Start Options field, check Start workflow automatically when an item is created and Start workflow automatically when an item is changed, shown as figure below. As we can tell, there is a OOTB column in the Task list named Outcome which shows the Approved status of Approval workflow. When it turns into “Approved”, then the current date is the “Approved Date” you want. So I use the workflow to get the current date i.e. “Today”. Then we can create a new column in Task list (in my demo, it is Date) to display it. Could you please have a test per my steps in my first reply? Any question, let me know. Not the answer you're looking for? Browse other questions tagged sharepoint-designer sharepoint-server designer-workflow workflow-manager or ask your own question.